There will be a Mass of Thanksgiving at 7.00 pm on Tuesday 3rd April at Christ the King followed by a reception in Harraby Catholic Club. This will be our farewell to Sr Gerald so please make a special effort to come along. Please keep her in your prayers. 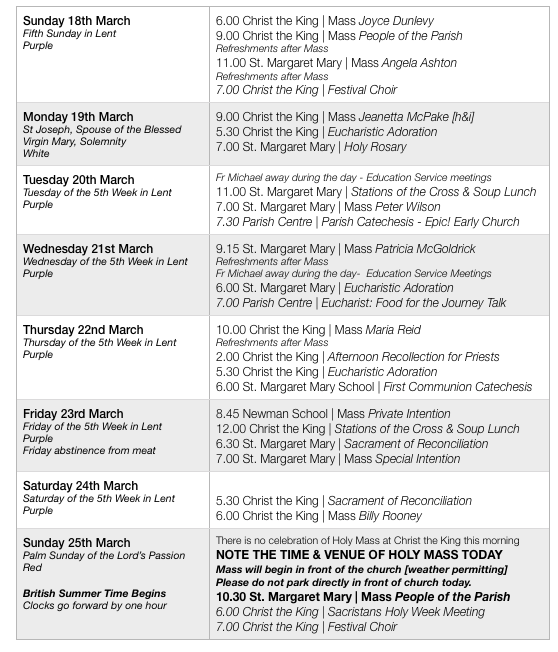 Thank you to all who have assisted in any way to make the celebration of Palm Sunday and the Triduum such a success. Particular thanks to all who work behind the scenes to ensure that our churches are clean and worthy places for the celebration of the Holy Sacrifice of the Mass. There will be a vigil of prayer for the intentions of Monsignor Paul Swarbrick - Bishop Elect of the Diocese - on Sunday 8th April at 5.00 pm at St. Margaret Mary’s. This vigil will take the form of a Holy Hour with recitation of the Holy Rosary and Benediction of the Blessed Sacrament. Please do what you can to attend. At Mass - 265 Offertory - £773.82. Thank you. A major fund-raising event for Newman Chapel will be a variety show, That’s Entertainment, to be held on Friday 11 May 2018, in the Sands Centre. Tickets may be obtained from the Sands Centre - £10/£8. On the weekend of 7th-9th September, there is a national Eucharistic Congress in Liverpool to deepen our appreciation and love of the gift of Christ in the Eucharist. There will be a parish pilgrimage to the Congress on Saturday 8th September, where the key-note speaker is Bishop Robert Barron. To sign up for this [the cost will be £50], please use the sheets provided. More details will be available nearer the time but we need to confirm numbers for tickets. On Friday 6th April, a Fish & Chip Supper will be held in the Parish Centre at 8.00 pm. This has been organised by the Knights of St. Columba and parishioners. If you’d like to come along, the cost is £5.00 per head - pre-booking is required. Please see Paul Lovell or Peter Osborne by Sunday 1st April. We hope this becomes a regular event in the parish. Thanks to all who contributed to this appeal. If a parishioner, who is a taxpayer, would like to join the scheme, please contact Judith on 526781 for Christ the King or Richard on 544737 for St. Margaret Mary. If you are attending Mass exclusively in the parish and have envelopes for another parish - please consider transferring your contribution to this parish. See Judith or Richard. Please consider giving via the Gift Aid scheme - it increases your donation without any additional cost to you. The Family Weekend (25-27 May) is an opportunity for families to come together for the weekend. There will be activities for all age groups and the opportunity to meet old friends and make new ones. Open to all families. Sponsored Walk - a new venture to raise the funds to support our work. We are looking to recruit a small group for a challenging 15 mile walk in the Lake District, on Monday 28 May, with a target to raise a £1,000 each. If you or a parishioner would be enthusiastic to take part, please get in touch; if people aren’t able to join us walking they can still support us through collecting sponsorship and we’d be grateful for your support in any way. Google Castlerigg Manor for more information about these events. Please avoid placing these in the offertory collection - they can be exchanged at a bank. A new initiative in the parish. If you fancy learning to sing some Gregorian Chant, why not come along to St. Margaret Mary on Wednesday 18th April at 7.00 pm [after the Holy Hour]. We’ll begin with some basics and see how we get on…all ages welcome. No experience necessary. Cor et Lumen Christi Community invites you to join them for Called to Glory 5: The Spirit of Glory, to be held on 14-15 April. Fr Gabriel Joseph and Niklas Carlsson of Cor et Lumen Christi will lead this weekend of inspirational teaching, praise and ministry. A spiritual spa day for women, led by Cathy Fava, to be held on Saturday 5 May. Both events at St Cuthbert’s, The Old Convent, Wigton CA7 9HU. Donation only. For more information, phone 016973-45623, visit www.coretlumenchristi.org or e-mail stcuthberts@coretlumenchristi.org. The new Bishop is leading a pilgrimage to the national shrine of Our Lady, Walsingham, Norfolk: Thursday 2 – Friday 5 October. More details from the organiser, Paul Briers: guildshop@yahoo.co.uk or 01946-834834. To be held in Pirelli Social Club, Dalston Road, Carlisle on Thursday 12th April 2018 in aid of Marys Meals (supporting St Gabriel’s School in Liberia). Doors open at 7.00 pm, show starts at 7.30 pm. Tickets: £5.00. For tickets and more information, contact: Maureen 07929 654859 2maureen_wilson@talktalk.net or Yvonne 07487 544517. 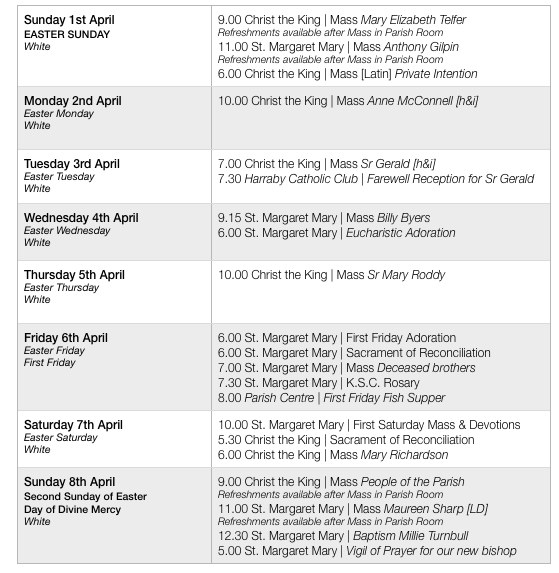 The Triduum this year will be held at Christ the King. The Mass on Holy Thursday will be at 7.00 pm. On Good Friday, the afternoon liturgy will be at 3.00 pm. The Easter Vigil on Holy Saturday will begin at 8.00 pm [sunset being 7.46 pm]. There will be a celebration of the Office of Readings and Morning Prayer at 10.00 am on Good Friday and Holy Saturday. 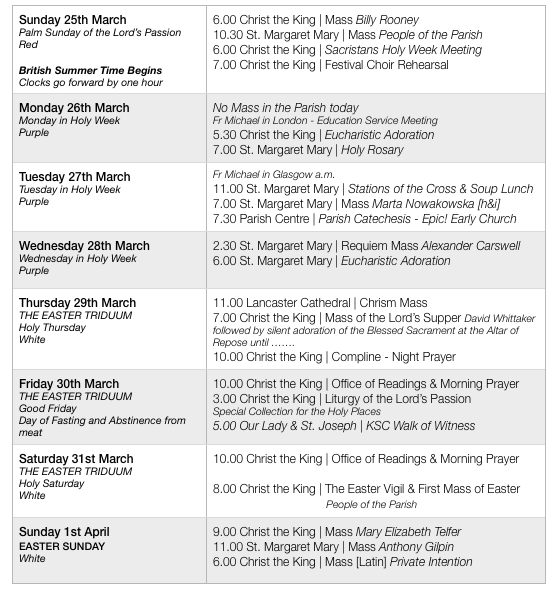 Easter Sunday Morning Masses will be as a normal Sunday with the additional Latin Mass in the evening. 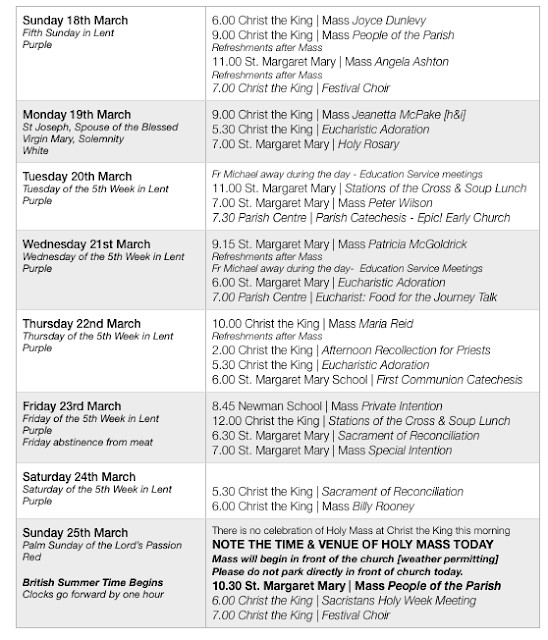 There will be a meeting for Sacristans today, Sunday 25th March, at 6.00 pm at Christ the King to go through requirements for Holy Week and Easter Sunday. For over 60 years there has been an annual Walk of Witness on Good Friday organised by the local Council of the Knights of St Columba. This year the walk starts at Our Lady and St Joseph’s Church at 5.00 pm. A Coach will be provided throughout the walk and for the return from the Wayside Shrine at the corner of Wetheral Plains Road. Those wishing to go directly to the Shrine for the short service should plan to arrive by 6.15 pm. At Mass - 259 Offertory - £652.16. Thank you. A major fund-raising event for Newman Chapel will be a variety show, That’s Entertainment, to be held on Friday 11 May 2018, in the Sands Centre. Book the date. Envelopes for the next financial year are available for those parishioners who are members of the scheme. Standing order donors do not need to take any further action, unless they wish to increase their contribution. If a parishioner, who is a taxpayer, would like to join the scheme, please contact Judith on 526781 for Christ the King or Richard on 544737 for St. Margaret Mary. Fr Michael wishes to thank you for the gifts and greetings he received on his recent birthday - they were very much appreciated. Thanks also to all who contributed their time and efforts to make the ’24 Hours for the Lord’ such a success. Sometimes we’re invited to set aside a ‘can’t be bothered’ attitude and do something extra for the Lord - many thanks to those who did this. Sponsored Walk - a new venture to raise the funds to support our work. We are looking to recruit a small group for a challenging 15 mile walk in the Lake District on Monday 28 May, with a target to raise a £1,000 each. If you or a parishioner would be enthusiastic to take part, please get in touch; if people aren’t able to join us walking they can still support us through collecting sponsorship and we’d be grateful for your support in any way. Google Castlerigg Manor for more information about these events. Please avoid placing these in the Collection - they can be exchanged at a bank. In our own deanery: Wednesday 21 March, at 7.00 pm in St Margaret Mary’s Parish Community Centre, Scalegate Road, CA2 4JX. Fr Michael Docherty will speak on “Eucharist: food for the journey”. We meet each Sunday at 7.00 p.m. in Christ The King Church. We would welcome more people to join us. If you would like to give it a try, please come along to one of our rehearsals. Young people from Year 6 onwards are especially welcome. At Mass - 249 Offertory - £629.15. Thank you. Once again we will be distributing food parcels to local families in need before Easter. We hope to deliver parcels during the week beginning Monday 19th March. Tinned meat and tinned fruit are especially welcome. Thank you for your continued support. Items may be placed in the food box at the back of St. Margaret Mary Church. Envelopes for the next financial year are available for those parishioners who are members of the scheme. Standing order donors do not need to take any further action unless they wish to increase their contribution. If a parishioner, who is a taxpayer, would like to join the scheme, please contact Judith on 526781 for Christ the King or Richard on 544737 for St. Margaret Mary. 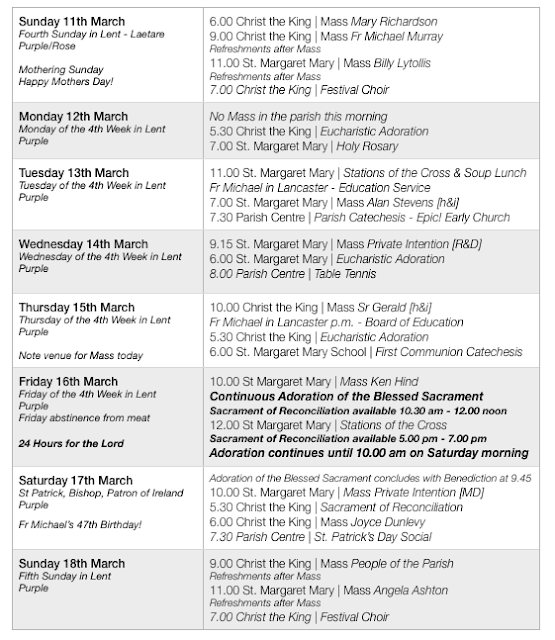 There will be a meeting for Sacristans next Sunday, 25th March, at 6.00 pm at Christ the King to go through requirements for Holy Week and Easter Sunday.